In Alicante, the old town is roughly a triangular area enclosed by the Rambla de Mendez Nunez, the Explanada de Espana, and Mount Benacantil. Alicante Old Town, or El Barrio as it is affectionately known, is very tourist friendly and the old, narrow streets lend themselves to an enjoyable stroll back in time and also offers some of Alicantes finest tapas bars and restaurants, serving both international and authentic Valencian dishes. 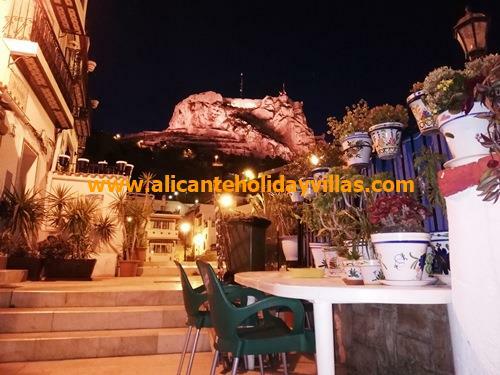 During the day, Alicante Old Town is a very quiet and calm place with many old buildings, a convent, bars and art galleries located within the narrow streets, but at night, El Barrio becomes alive. The imposing Alicante Town Hall, with its twin towers, looks out over a square lined by arcaded walkways, was built in the 18th Century and is well worth a visit whilst in Alicante. Just inside the entrance is a dramatic statue of Dali and, just below it, on the staircase of the Town Hall is a brass stud, which is used for measuring the sea levels around Spain. Climb the staircase to visit striking Salon Azul (Blue Room) and the small chapel. During the summer months, many weddings are held at the Town Hall in the evenings and you may be lucky enough to see one whilst you in Alicante. Just below the Castle, and opposite the beach, in Calle Jorge Juan, is the Iglesia de Santa Maria (St Marys Church), which is the oldest church in Alicante. Built between the 14th and 16th centuries in gothic style, the Iglesia de Santa Maria stands on the foundations of a Moorish mosque. In the church itself there is a wide range of art with the most valuable two dating from the 15th century, plus a 16th century white marble font attributed to the school of Michelangelo. The San Nicolas de Bari Cathedral in Alicante, built in the 17th Century, is situated in the Plaza Abad Penalva in Alicante Old Town and is built in the Herrerian renaissance style. Completed in 1662, the San Nicolas de Bari Cathedral is surrounded by a warren of streets that signify Alicante Old Town. Like the Iglesia de Santa Maria, San Nicolas cathedral was also built on the remains of a mosque, (which was a common practice in those days, with the intention of eradicating any trace of the Moors) and has a beautiful blue dome over 45 metres high. The Communion Chapel inside the Cathedral is well worth a visit and is considered one of the most beautiful Chapels in Spain. 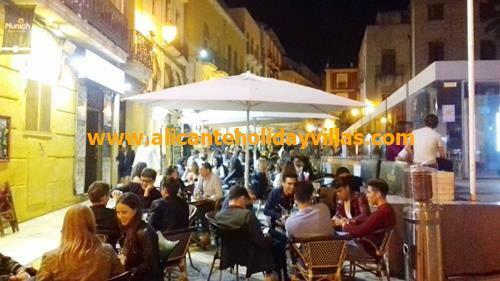 El Barrio, or Alicante Old Town, is a very lively neighbourhood at night with people of all ages enjoying the numerous bars, discos and cafes. The nightlife starts fairly late by English standards with many establishments not opening until 11pm and continuing until the small hours with music ranging from salsa to jazz, rock to sevillanas and more modern music too. 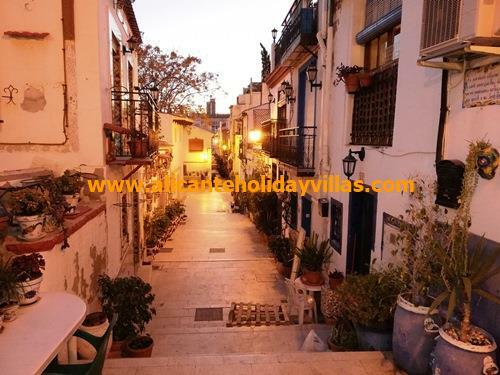 Santa Cruz is the name given to the oldest quarter of Alicante on the slope of Mount Benacantil and features narrow cobbled sloping streets with small white houses with balconies decorated with flowers and is very picturesque. At the top of Santa Cruz is the Ermita de la Santa Cruz (a small church) , close to the ramparts of Santa Barbara Castle which was constructed at the end of the 18th Century and once formed part of the old walls of Alicante town. On 3rd May each year, on the day of the Holy Cross (Santa Cruz) this quarter celebrates with a fiesta of food and all the streets are elaborately decorated and crosses are made from flowers. See our page on the May Crosses here for more details. The Old Town in Alicante is a great place to visit if you want the feel of a typical historic Spanish town.